YD3200-RC Hybrid Printer adopts imported original grey level Ricoh G5 internal heating industrial printhead, the number of printhead can be increased or decreased according to your requirements, the print speed can up to 38㎡/h (4 PASS), Can meet the demands of large quantities production capacity, Specially design a high-speed and high - precision UV printer for medium and small size processing enterprises and can meet their high precision and high speed production requirements. Ricoh Gen5 print head has higher print speed and performance with its internal heating function compared to other types of printheads. It is durable and suitable for all kinds of ink. Its variable drop printing(7pl-35pl) delivers more delicate and higher resolution print results. 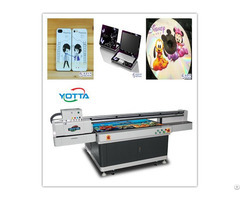 This printing machine has two printing function: rolling printing and flat bed printing. In addition to printing roll-to-roll, you can also print rigid materials with the maximum size of 3200mm as normal flatbed printer do. The cartridge stop working automatically when it collides with medias, protect the cartridge and printheads from damage. 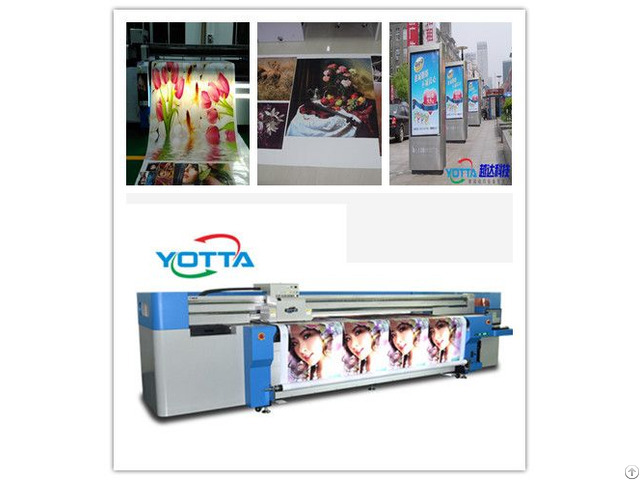 YOTTA UV printers employ UV LED lamps for UV curing, which is power-saving and efficient. No heat produced, it has a huge advantages on printing thermal sensitive substrate. Besides, UV LED lamps is long-life and zero-pollution. 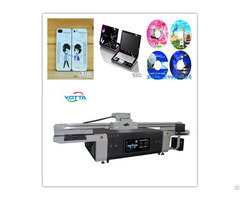 YD3200-RC hybrid printer allows 4-7 color printing, including CMYK, Lc, Lm and white ink, with which can produce special image effects such as relief and 3D, to get your unique prints. Automatically measure the thickness of substrates, precise, time-saving and labor saving. YOTTA printers use negative pressure system to make ink supply smoother and get more vivid images. With pressure display, the pressure is easy to be seen and adjusted. No VOC UV curable ink and no pollution UV LED lamps are used. Posted By: Shenzhen Yueda Printing Technology Co.,Ltd. 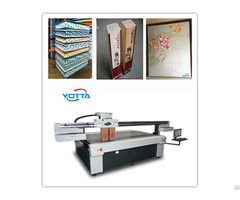 Business Description: We specialize in manufacturing UV different types and sizes of flatbed printers.Our printers can print any pictures on any flat materials with embossment and 3d effect.They are widely used in advertising,decoration and other industries.